The name may sound as if its origin is full of foreign intrigue, but the reality of Caribbean Stud Poker is that the back story of the popular table game is more “mundane” than “mysterious”. It actually began on cruise ships back in the 1980s as a way to play poker against a dealer rather than other players at the table, and then sometime in 1987 a Las Vegas casino insider named James Suttle acquired the rights to the game. And just how did he get them? Well, legend has it that he supposedly bought the patent for a song from a gambler on a bad run in Binion’s Horseshoe Casino. In short order, Suttle resold the rights for a profit to casino owner Danny Jones who ran the King International Casino in Aruba. Jones then spent several years trying to sell the game, that at the time was simply called “Casino Poker“, but the way the game was played there was just too big of an advantage for the House. Gamblers on cruise ships never cared about throwing money away onboard sailing the high seas and simply chalking it up to a “good time”, however, brick and mortar casinos who relied on regular customers did not want to gain a reputation for dealing unfair games. It took a computer specialist named Michael Titus to solve the problem, who calculated that a progressive jackpot similar to linked slot machines on a network could compensate for the House-friendly game play. Titus and Jones cobbled together a progressive jackpot that worked for table games and rebooted “Casino Poker” as “Caribbean Stud Poker”, which became the standard version that you will find at United States online casinos that we are all familiar with today. Like a normal poker hand, Caribbean Stud Poker starts with a mandatory ante up to the table limit. Any player wanting to contribute to the progressive jackpot makes an additional bet that is separate from the money that is riding against the House. Then if the player is dealt at least a flush they win a portion of the jackpot, with each higher hand paying out more, and the entire jackpot going to the player if they have a Royal Flush – the highest hand possible. During the regular game, once all bets are placed the dealer distributes five cards to each player face-down as well as four face-down to the house, and the final card to the dealer is delivered face-up. In Caribbean Stud there are no bluffs and no additional cards to draw or be revealed. All payouts are based on a payable that begins at one pair, so at this point if the player has no playable hand the cards are folded and both the ante and the progressive bet, (if one has been made), are lost. If the player holds at least a pair and wants to take on the dealer’s hand based on their exposed card, a bet equal to the ante must be placed onto the table. After all players have mucked their hands or placed a bet the dealer’s hand is revealed. The dealer must have at least King High or the hand is declared “No Play”. Anyone who stayed in beyond the ante wins that bet back plus a matching total from the dealer. The secondary bets are returned to the players since the dealer didn’t have a playable hand or “did not open”. If the dealer holds playable cards and “opens”, all bets are in play. Like blackjack, players are competing only against the dealer and not the other players seated at the table. If the player’s hand beats the dealer’s, the return is determined by the posted pay table. The amounts vary from place to place but generally it will be even money for a pair and can be up to 100x the original wager for a Royal Flush. If the dealer has the high hand both the ante and the bet are lost. None of this has an affect on the progressive bet, however. A player can have a full house and lose to a dealer straight flush but will still win the designated share of the jackpot. The usual cost to play the progressive jackpot each hand is $1. 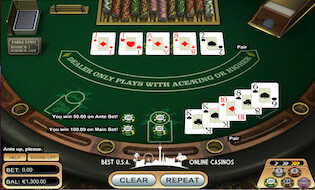 Some casinos will offer the exact same game play as described above but call it “Caribbean Hold’em”. There are also Caribbean Draw Poker games where hands can be improved by drawing one or two cards, but usually this will bump the playable dealer hand from King High to Eights or Better, or a similar small pair. Some European versions dispense with the jackpot and deal “Casino Five Stud Poker” just like the cruise ships. Like blackjack, there are optimal strategy charts for Caribbean Stud Poker that will lower the house edge to about 5%. When deciding to take on the dealer’s hand based on a single card showing, the aggressiveness of your play hinges on whether you hold a “blocker” to the House’s potential pair – especially if the dealer card outranks your highest pair. Without bluffing and raising, the main excitement of Caribbean Stud Poker is the potential to win the progressive jackpot, which can sometimes be 6 figures. Otherwise this is just a game of War with five cards. It’s advised to always play the side game to give yourself a chance to win the life-changing cash prize.